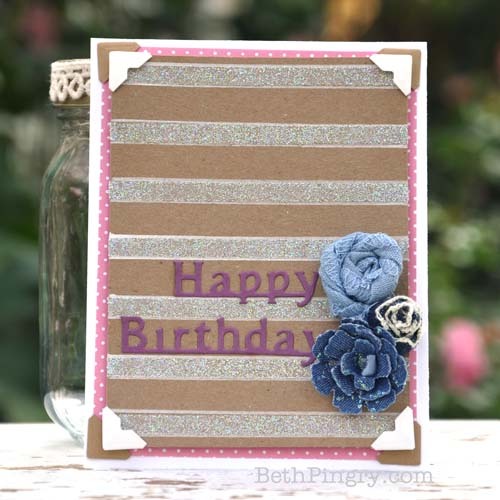 Hello everyone, it’s Beth, and I have a striped birthday card full of glorious glitter! This was a fun one to make! 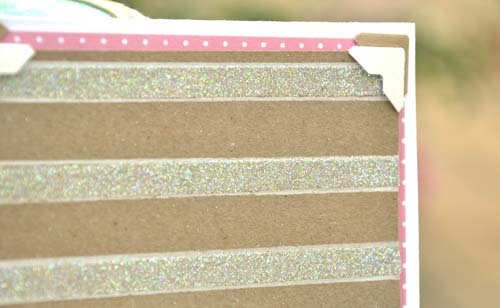 The stripes were created with Premium Double-Sided Tape 1/4″, just like the stripes on this Happy Day card. To make the stripes stand out more, I used a white marker and ruler on each side of the glitter. Next I die cut Happy Birthday, and adhered it with Adhesive Sheets 4×6″ that were applied to the cardstock before running through the die cutting machine. 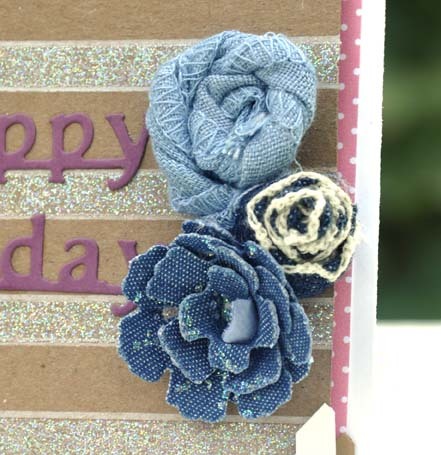 The flowers, two are simply spiraled denim colored ribbon and canvas ribbon, and the other is die cut thin denim fabric, just like the way I made the roses on this Explore Tag. All are adhered with Adhesive Dots. Additionally I applied E-Z Dots® Repositionable to the denim die cut flower, and added a bit of glitter to it. Finally, the layers of papers are adhered with Creative Photo Corners, I love to stack them like that, it frames out the card nicely. Thanks for visiting, be sure to pin your favorite projects and follow us on Pinterest! This entry was posted in Adhesive Dots & Lines, Adhesives, Cards, Crafts & Tutorials, Creative Photo Corners, E-Z Runner® Dispensers, HomeHobby by 3L, Intermediate, Permanent Adhesive, Premium Double-Sided Tapes, Skill Level, Wear your Adhesive on the Outside and tagged Adhesive Sheets 12x12" (25 sheets), Adhesive Sheets 12x12" (5 sheets), Adhesive Sheets 4x6", Adhesive Sheets 6x12", Beth Pingry, Birthday, Card, Clearsnap, Creative Photo Corners Kraft, Creative Photo Corners Mix Pack, Creative Photo Corners White, E-Z Dots Repositionable, E-Z Dots Repositionable Refill, E-Z Dots Repositionable Refillable, E-Z Runner Grand Repositionable Dots Refill, Flowers, Glitter, HomeHobby by 3L, Premium Double-Sided Tape 1/4", Spellbinders Paper Arts. Bookmark the permalink.